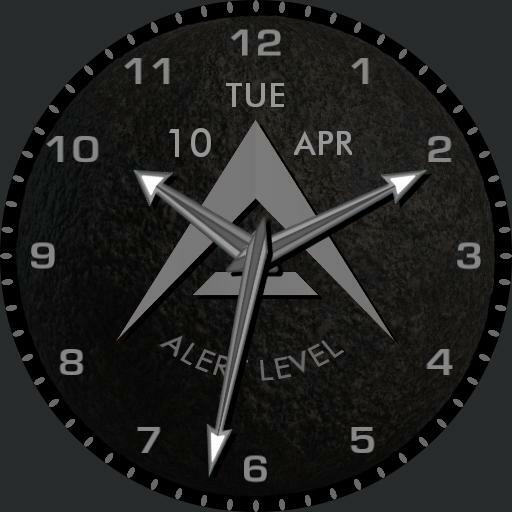 Military Alert Level Red 3 Face collection. Face 1, Analogue time, Date, short day name and day number and short month. Flashing Alert Level continuous. Tap position 6 to park watch hands at noon. Face 2, Date, Full day name and day number and full month name. digital time 12 and 24 hour selection by tapping the hour, Weather icon and condition and low and high temperature levels. Flash effect on fonts. Face 3, Power levels for watch and cell, Stopwatch, Steps count and Heart rate, Flash effect on fonts.Tap actions, centre to swap between faces. position 6 to park watch hands at noon Face 1.